Late Sunday afternoon, we decided to get out of the house for a little bit, and found ourselves deep in Lincoln and Logan counties, legend tripping! Since this trip was a spur of the moment thing, I did not plan well, lol. With no internet connection for most of the trip, we were unable to find the original 'haunted' cemetery we were looking for, but that story is for another day! However, the day wasn't a complete bust as we did manage to stumble upon a tiny little historic cemetery located on the grounds of Harts PK-8 School, located in Harts, WV---right near the Lincoln County/Logan border. We got out to take a few pictures and soak in some local history, which was actually quite fascinating! There's no way I can even start to do the story of the Brumfield-McCoy-Adams-Hall Feud justice in a simple blog post. The story is a convoluted one, lasting over a decade, involving multiple families, and resulting in the deaths of at least 4 people. The late 1800s were a turbulent time in the timber-rich area of the Guyandotte River and by the time the fighting over land, business, and personal matters had come to a close, a permanent mark had been left on the county. 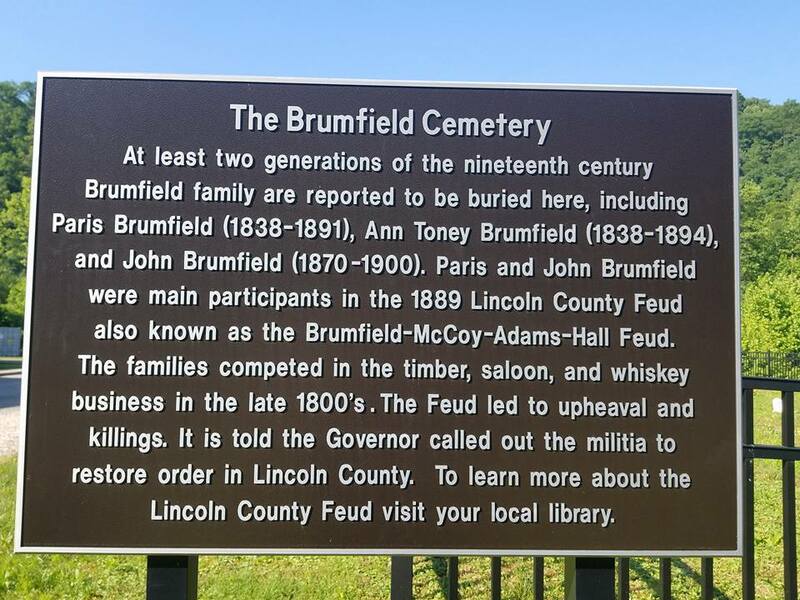 The Brumfield Cemetery, or Paris Brumfield Cemetery, contains only a handful of graves. 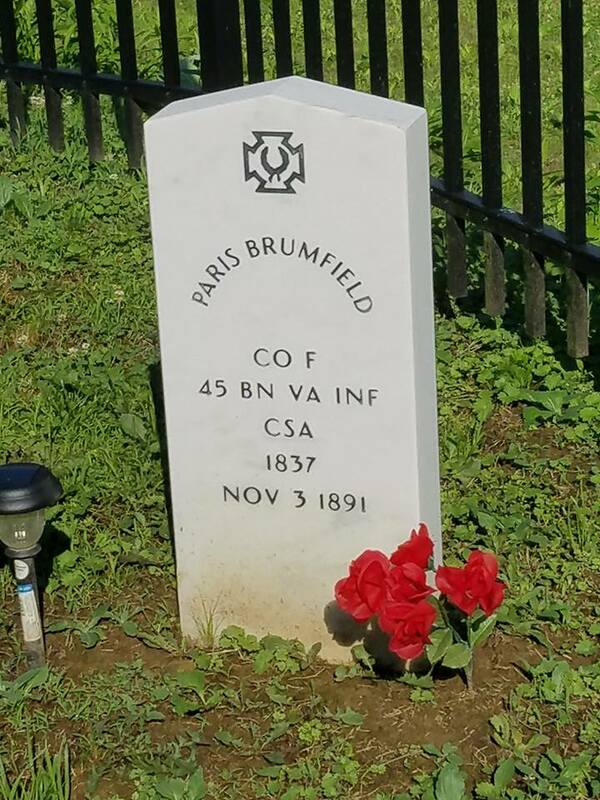 With the exception of two, including that of Paris Brumfield, veteran of the Civil War, the final resting spots for many members of the Brumfield family are marked with a simple white rock. 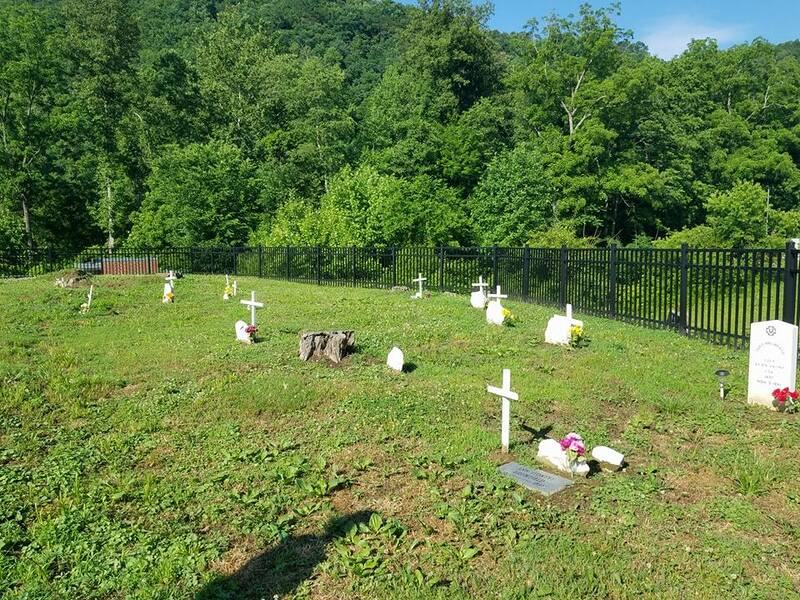 Local historian, author, and family descendant, Brandon Ray Kirk, has added white crosses to some of the graves and keeps the grass trimmed. Brandon has also spent years researching the feud and family histories. 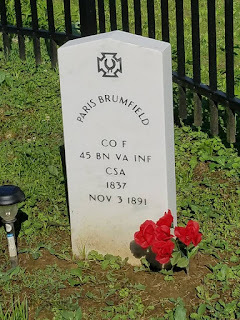 His work can be found in the book, Blood in West Virginia: Brumfield vs. McCoy, a popular non-fiction account of the Brumfield Feud. You can also follow his work on the book's Facebook page, where he posts a wealth of information, photographs, and documents related to the feud, its participants, and local history. Further local history, provided by Mr. Kirk, can be found on his blog. Below, I've also included an embedded video from the WV State Archives of a 2015 discussion given by Mr. Kirk at the Cultural Center in Charleston concerning the feud. So there ya go! If you're thirsty to know more about this underrepresented piece of West Virginia history, there are some great resources out, provided by a local historian with the passion to keep the memory of his ancestors alive. 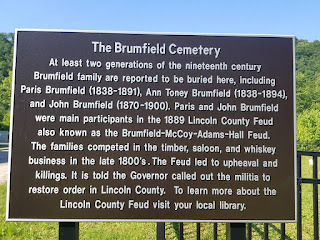 I, for one, really enjoyed learning about the impact of the Brumfield family on the area, and I can always appreciate a visit to a cemetery! My 8 year old son, Luke, also seemed to really get a lot out of our trip. It's moments like the one I captured here of him intently reading the historical sign, that as a lover of history myself, warms my heart, lol. He immediately wanted to know more about who these people were who were buried within the fenced-in plot of land and what they were fighting about. If you're not too far away, I recommend making the drive out to Harts, West Virginia. There's some beautiful scenery out that way, and some fairly interesting scenery as well. There are also plenty of other stops close by in Logan and Chapmanville of historical interest. We hit a few of those places as well---but again, that's for another blog! 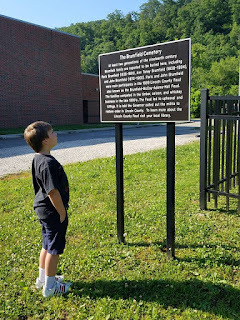 This quick little spur of the moment trip is just the start of a summer filled with exploring West Virginia's history, often from a paranormal perspective. I'll be sure to update you on all my family's spooky adventures over the next couple of months. You can follow me on Theresa's Haunted History Facebook for updates, and if you'd like to share your own ghostly travels, I'd love to hear them! Have a safe and happy summer, and I'll catch ya back here soon with some new blogs on the various specters of the Trans-Allegheny Lunatic Asylum, the WV State Penitentiary, and a few state parks---all wonderful places to visit on your own summer travels through the Mountain State. Stay spooky, ya'll!